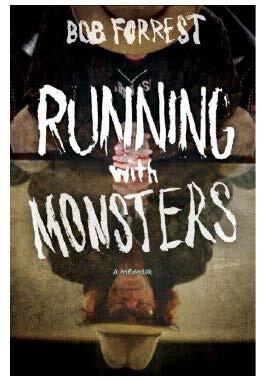 Bob Forrest (the guy with the hat and glasses on Celebrity Rehab) has written a blisteringly honest account of his life, loves, career, addiction and recovery in Running with Monsters. If you think you know him simply from the low key advice he gives on VH1’s popular show, read on and learn more about the 80’s music/drug scene in L.A. and an addict’s constant battle than you might ever thought existed. What I liked most about this book was the ease with which Forrest and his co-writer Michael Albo lay out the memoir. It’s not that Forrest comes from an abusive upbringing but there was more than the hint of alcoholism in the people who raised him (and I use the phrase “raised him” for reasons you will read in the book) and this alcoholism, as with everything else in Forrest’s life is simply a fabric of the man’s whole experience. Forrest does not ruminate, takes very few moments of reflection unless it moves the story along and generally provides a hardcover read as much about his drug use and popular music career (which I had not a clue about) as his hanging-out in L.A. in the 80’s and 90’s, befriending Flea, River Phoenix (he was at Viper Room interacting with Phoenix the night he died) as well as his recovery. We get a last chapter on the VH1 show that made Forrest a T.V. presence (and a show that he was instrumental in creating…another fact I did not know) and a wrap-up of of where he is now with his wife and baby. Running with Monsters is a monster good read.